Property developer UEM Land Bhd is selling two parcels of land totalling 1.68 ha in Puteri Harbour, Nusajaya, Johor, for RM26.7 million. A sale and purchase agreement was signed between Bandar Nusajaya Development Sdn Bhd and Themed Attractions and Resorts Sdn Bhd (TAR), a wholly-owned subsidiary of Khazanah Nasional Bhd, yesterday. In addition, a development management service agreement signed with TAR saw UEM Land being appointed as the development manager to supervise, manage and oversee the overall development of the land. A condition of the deal is that TAR will develop the land into an indoor theme park, retail centre and hotel within four years from the date of the agreement. Construction on the RM350 million indoor theme park is to start in the middle of next year, with completion expected by the end of 2012. TAR was incorporated in June 2009 to develop and operate themed attractions and resorts to enhance the leisure and tourism industry in Malaysia, with a special focus on families. UEM Land said it has identified strategic partnership with reputable developers as a key strategy to accelerate the development of Nusajaya and Puteri harbour. The proposed development concept for the land by TAR is in line with UEM Land's overall vision for Puteri Harbour. The proposed indoor theme park, retail centre and hotel are expected to create commercial activities and spillover effect that will add value to Puteri Harbour. TAR is currently managing two projects, namely Kidzania in Kuala Lumpur and Family Indoor Theme Park in Puteri Harbour, Johor. In a statement released last Sunday, TAR chief executive officer and managing director Tunku Datuk Ahmad Burhanuddin said he expects 400,000 visitors at the indoor theme park in the opening year itself. He said the project has the capacity to further stimulate Johor's economy and will benefit people through the creation of 1,000 job opportunities. Last Saturday, TAR entered into a strategic alliance with five partners for the integrated four-storey family indoor theme park. SHAH ALAM: Certain industrial and older housing enclaves in Petaling Jaya (PJ), Klang and Kajang have been identified for redevelopment in a bid by the Selangor government to enhance their land value and to create a stimulus for the state. Selangor Menteri Besar Tan Sri Khalid Ibrahim said the regeneration exercise would kick off in PJ. Owners of buildings in “three or four” areas, among them Section 13, will be given incentives to redevelop their buildings into commercial use. “We have written to the industries concerned to relocate. If they agree to move, they can rebuild on the existing tract of commercial property with certain densities,” Khalid told The Edge Financial Daily and theedgeproperty.com in an interview here yesterday. These industrial operations would be allowed to be relocated to other more acceptable areas in Selangor, such as those near ports, he said. Redevelopment would surely create traffic and transportation related issues, congestion being at the top. So, won’t residents complain? “In a way, yes,” conceded Khalid. Towards this end, the state government has asked for another transportation study to be carried out, based on various increased densities in the areas concerned. This is to establish whether these higher densities are feasible. The concept of park and ride is also being considered. According to a report in City & Country, the property pullout of The Edge weekly earlier this year, the 220-acre hub of industrial activities in Section 13 was now dotted with “limited commercial” developments in the form of modern offices and retail blocks. Factories have been operating in Section 13 since the 1960s but in recent years, its growing potential for commercial activities could not be ignored, given its strategic location. This explained the Petaling Jaya City Council’s approval for “limited commercial” activities there, based on certain guidelines. Meanwhile, on the revival and rehabilitation of abandoned housing in Selangor, Khalid said they had been quite successful — thanks to land value appreciation over time, resulting in people willing to pay more for the completed units. The challenge, however, was in the selection of the best contractor or developer to complete the projects. Some of the projects were initiated by the state government which was willing to lose “a bit” so long as the project was completed, added Khalid. SHAH ALAM: The Selangor government has given TALAM CORPORATION BHD three months to settle a total of RM391 million in debts owing and due to the state for its failure to deliver on a number of projects, said Menteri Besar Tan Sri Khalid Ibrahim. Simultaneously, the state assembly yesterday approved a supplementary budget of RM391 million to Menteri Besar Inc (MBI) pursuant to the debt recovery exercise. MBI will buy the debt from the state government and assume responsibility to recover the debt owing from Talam. Khalid said the RM391 million debt owing from Talam stemmed from several real estate development joint ventures with state subsidiaries over the past 10 years. The debt collected will be injected into the state consolidated funds. “Previously, the debt was in most cases neither fully-recognised nor well-recorded in the books of the state subsidiaries as the creditor. No efforts had been made by the previous state government to recognise and claim the debts and the state will risk writing off the debt if no proper action was taken,” he said in a statement. Speaking to The Edge Financial Daily here yesterday, Khalid said the state would undertake an audit of the state subsidiaries accounts and had determined that over RM500 million was owing from Talam, which disputed the figure. He added that both parties settled for RM391 million. “We have given Talam a three-month deadline,” Khalid said, adding that the company faced the prospects of foreclosure on its assets and properties if it failed to pay up by then. “Previously, we (the state) was at the lower rung of creditors, now we want to be at the top rung,” he said. Khalid added that Talam was undergoing a restructuring exercise, which should include the settlement of the amount owing to the state. In its 2009 annual report, Talam said it had been unable to meet its financial obligation to bear the development and maintenance costs of about RM134 million in the Universiti Industri Selangor (Unisel) project, whereby the state had alienated three parcels of land to the group for the development of Unisel. Talam said it had agreed to settle the obligation by transferring 1,715.9 acres of land in Batang Berjuntai valued at RM80,000 per acre to Kumpulan Darul Ehsan Bhd and Pendidikan Industri YS Sdn Bhd, both nominees of the state government. DUBAI: Dubai will pay its massive debts and will go ahead with its ambitious development projects, the emirate's ruler Sheikh Mohammed bin Rashid al-Maktoum told an economic conference yesterday. The economic crisis "will not deter Dubai's ambitions of implementing its development plans and will not divert it from its leading position and will not (keep) it from playing its role in the arena of the international economy," Sheikh Mohammed said. Unlike the United Arab Emirates' capital Abu Dhabi, Dubai has no significant oil resources, and has been hard-hit by the economic crisis, with property prices plunging by 50 per cent from their peak. A study issued by Standard and Poor's last month estimated that state-related companies in Dubai are due to repay nearly US$50 billion in debt (US$1 = RM3.38) 70 per cent of the Gulf emirate's estimated GDP - within the next three years. To meet the obligations of its companies, Dubai is issuing treasury bonds worth US$20 billion, half of them subscribed to by the Central Bank of the UAE. "Would be directed to settle Dubai financial obligations in the coming years." Some 400 real estate projects in the UAE, valued at around US$300 billion, were reportedly frozen due to the crisis. Local real estate giant Emaar announced losses of US$350 million for the second quarter of 2009. Among the many grandiose projects that were shelved by government-linked companies was a US$95 billion development of a new district within Dubai. However, the government has pressed on with infrastructure projects, including the construction of the Dubai Metro which opened in September. Sheikh Mohammed said Dubai's success is due to more than just real estate, which was not "the sole driver of our development." He also emphasised the unity of the UAE, of which he is prime minister, saying that "Dubai is (an) inseparable part of the United Arab federation." BUDGET 2010, that was tabled on Oct 24, saw the Government taking concerted effort to encourage Malaysians to embrace green technology. This is a move in tandem with growing concerns of not only Malaysians but the entire world in preserving our resources and the environment for the future. The drive to preserve the environment comes with monetary costs and certainly with government incentives to ease such cost from the individual will bring economic sense to environmental objectives. To intensify green-awareness activity and to encourage the practice of environmentally-friendly lifestyle, the Government had allocated RM20mil. Among other efforts, is an international exhibition on green technology that will be organised in April 2010. The Government will also give priority to environmental-friendly products and services that comply with green-technology standards in government procurement of goods and services. A fund of RM1.5bil has been allocated for soft loans to companies that supply and use green technology. For suppliers, maximum financing is RM50mil per supplier and, for users, it’s RM10mil per company. The Government will bear 2% of the total interest rate in the said soft loan and will guarantee 60% of the amount financed. Applications for this “green loan” are to be made to the National Green Technology Centre and the scheme will commence on Jan 1, 2010. It’s estimated that a total of 140 companies could benefit from the “green loan”. 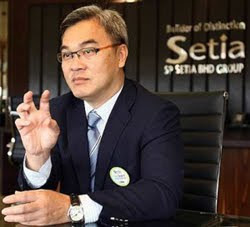 Apart from such broad-based initiatives, the Government has come around to back the Green Building Index (GBI) by Persatuan Akitek Malaysia and the Association of Certified Engineers Malaysia in a two-tier strategy. First, building owners or developers obtaining the GBI certification between Oct 24, 2009 and Dec 31, 2014 will be given income tax exemption equivalent to the additional capital expenditure in obtaining the certificate. It is known in the industry that greening the building can add up to 20% on top of the usual construction cost. Such additional capital expenditure will then save the building owner in long-term operational expenditure as the cost of running the building will be cheaper. On the implementation of this tax exemption, developers and building owners will have a double benefit of not only saving long-term operational cost but also the upfront tax savings. It will be difficult to quantify the actual additional expenditure as building owners/developers could overstate the additional expenditure in order to obtain higher-income tax exemption. To this cause, it would be appropriate for the architects or quantity surveyors of the project to cost out this additional amount and for the Green Building Index Accreditation Panel to determine and certify the actual additional capital expenditure. Otherwise, it may also be prudent for the Government to fix the percentage of capital expenditure for the various GBI green ratings that is Platinum, Gold, Silver and Certified. For ease of operation, the latter may be a more feasible option. The second tier in the strategy is for stamp duty exemption on the instrument of transfer of ownership for first purchasers of buildings with GBI certificate from developers between Oct 24, 2009 and Dec 31, 2014. The exemption amount is reported to be equivalent to the additional cost in obtaining the GBI certificate. How this operates is actually unclear. The question asked: Is the additional cost in obtaining the certificate only or is the additional capital expenditure included? Nevertheless, these two tiers, tax and stamp duty incentive to promote the development of green buildings will certainly push developers to seriously consider green building technology. Developers and building owners will certainly decide to incorporate green features into their buildings to obtain the GBI certificate and take advantage of the tax incentives. Since the GBI certificate can be granted for both new construction and building upgrades, the move will also encourage owners of older buildings to upgrade their buildings to obtain GBI certification and thus claim tax exemption on such costs. Green building certification is not only for office buildings but also available for condominiums, industrial buildings, hotels and even townships. The Government has announced that Putrajaya and Cyberjaya are to be developed as pioneer townships in green technology. Therefore, even private developers could aim for GBI certification of their township and take advantage of the tax exemption on the additional cost to go green. The purchasers of their products will also stand to benefit from the stamp duty exemption. This will certainly give such development a competitive edge. These incentives stop on Dec 31, 2014 but, to keep the green momentum going, longer-term policies would be necessary. Sarkunan Subramaniam is executive director of Knight Frank Malaysia. He was in charge of the exercise to act for a major oil & gas company in its search for a green building to consolidate its principal office operations that was recently concluded in KL Sentral. DAMANSARA Realty Bhd (DBB) is planning a corporate restructuring to carve out its unprofitable businesses and streamline revenue streams to benefit its shareholders. It has proposed to exchange its entire paid-up share capital with shares of its wholly-owned subsidiary, Insan Kualiti Sdn Bhd (IKSB), with cash payment to existing DBB shareholders. The proposal will involve exchanging 250.14 million DBB shares of 50 sen each with 150.08 million shares of 50 sen each in IKSB and a cash payment amounting to RM80.05 million. The cash payment is 0.6 new IKSB share and payment of about 32 sen in exchange for every one DBB share. It also proposed for the IKSB to buy from Johor Corp (JCorp) entire Tanjung Langsat Port Sdn Bhd (TLP) for about RM249.05 million and the entire equity in TPM Technopark Sdn Bhd (TPM) for RM54.8 million. The total acquisition price of about RM303.85 million will be paid for by issuing 229.73 million new IKSB shares at 80 sen each and the remaining RM120.10 million to be set off against an amount due from JCorp. DBB also proposes that IKSB sells 250.14 million DBB shares to JCorp for RM200.11 million, of which RM80 million will be paid for by cash and the remaining to be set off against an amount due to JCorp. The corporate restructuring will eventually involve the transfer of DBB's listing on Bursa Malaysia to securities of IKSB. DBB said the corporate restructuring offers an opportunity for its existing shareholders to participate in the potential long-term growth of the new businesses to be injected, particularly the industrial development at the Tanjung Langsat Industrial Area and Tanjung Langsat Port services business. TLP is expected to be the revenue and profit driver for the IKSB group through the Tanjung Langsat Port services business. It said it would allow IKSB to rationalise its business, thus enabling it to focus on the business and prospects of TLP and TPM. ISLAMABAD: Malaysian expertise in low-cost housing for workers is expected to become the catalyst for the entry of more foreign direct investment in the booming industrial sector in Pakistan. Punjab Industrial Estates Development and Management Company (PIE) chief executive officer Sabir P. Chohan said Malaysia's track record in the housing industry was expected to provide added benefit to efforts to woo FDI. He said the government of Punjab was in the midst of negotiations with Malaysian housing giant, Renexus, on the proposed construction of 50,000 low-cost houses at industrial zones in Punjab. The first area that could see Malaysian-built units could be the Sundar Industrial Estate, an hour out of Lahore. "We have been in contact with Renexus and had hoped for a memorandum of understanding to be signed on November 26. But it has been postponed to a later date," he told a group of visiting Malaysian journalists. Sabir said the chief minister of Punjab, Shahbaz Sharif, had issued specific instructions to PIE to emulate the Malaysian model in building housing for workers at industrial estates. Sabir said two Malaysian companies - Bandaraya Development and Maxcorp Husnain Private Ltd - were already making a name for themselves in construction in Punjab, the largest of the four provinces with a population of 110 million. Bandaraya Development has developed a top-class tourist project while Maxcorp was involved in redesigning, developing, financing and operating activities of the former Pakistan Railway Club. On whether Punjab would follow the example of neighbouring Sindh province in creating an exclusive economic zone for Malaysian investors, he said the state provincial government had given the green light for the project. DOHA: Qatar's Ezdan Real Estate Co expects its net profit in the fourth quarter to be similar to that of the third and is aiming to sell part of its property portfolio by year-end to a Malaysian-basedREIT to finance new projects, its managing director said yesterday. Qatar's largest property developer by market value expects strong demand for affordable housing in its home market. The fourth quarter net profit result would be "similar" to the 94 million Qatar riyals made in the third quarter, Hesham el-Sahtary told Reuters in an interview. Ezdan, with about US$1 billion (RM3.41 billion) worth of projects under construction, is also working on selling some of its portfolio, worth about 600-700 million riyals to a real estate investment trust based in Malaysia to help finance future projects. "They will buy the property from us and we will manage it for them with a fixed return," said Sahtary. "The plan is to launch it in Malaysia as an international fund and we hope to conclude it this year," he said. KUALA LUMPUR: UEM Land Bhd is disposing of two parcels of land in Puteri Harbour for RM26.7 million to Khazanah Nasional Bhd's Themed Attractions and Resorts Sdn Bhd (TAR). 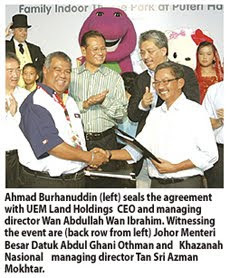 UEM Land said on Monday, Nov 9 that under the sales and purchase agreement, UEM Land would be appointed as the development manager to supervise, manage and oversee the overall development of the land. The objective is to develop the site into an indoor theme park, retail centre and hotel within four years. TAR is a unit of Khazanah. It was incorporated in June to develop and operate themed attractions and resorts to enhance the leisure and tourism industry in Malaysia, with a special focus on families. TAR is managing two projects and they are Kidzania in Kuala Lumpur and the Family Indoor Theme Park in Puteri Harbour, Johor.